How can I include an overview text / description for my gallery? How can I change the image transitions and slideshow speed for my galleries? How to move or copy Images and Videos between galleries? How does Image Compression work in Pixpa? A Gallery is the foundation of any portfolio website. To create a gallery, see this article. This article explains how to add images, videos and HTML slides in galleries. 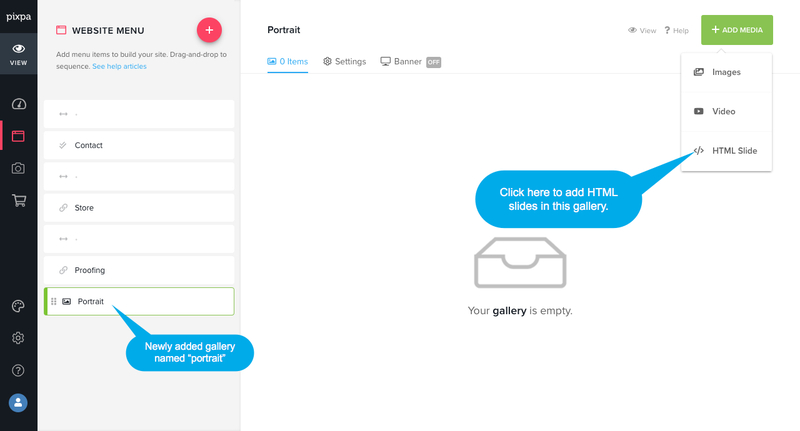 Pixpa allows you to add JPEG, JPG, PNG, and GIF file images in the website gallery. Click on the particular gallery in the website section where you want to upload images. Click on Images in the Add Media dropdown on the top right of the page. In the next step, You would see a popup uploader. Click on Browse and Upload button to select single or multiple images to upload to this gallery. You may also drag and drop your selected images there. Note: In case, If you have enabled the watermarking, You would see a checkbox. At the time of image upload, You can decide whether do you want to watermark for photos uploaded moving forward in this particular gallery or not. Click here to know more about watermarking. As you click on browse and upload button, You would see a system popup. Select the image/images you want to upload from your PC and click on open. The upload will start automatically. You can upload any number of images in one go. 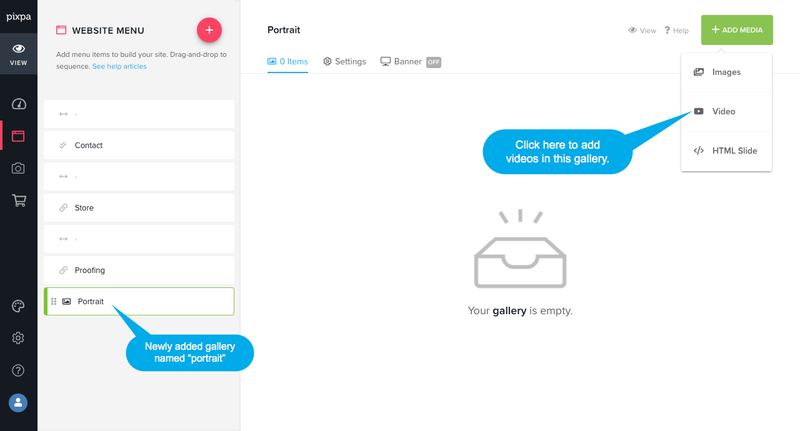 Once the images have finished uploading, click on the Close button to return to the Item Manager to continue to work on your gallery. System does not allow duplicate files in a gallery. If you are uploading a file which is already available in that particular gallery, you would see the error on the uploader. You need to delete this, rename it and upload it again. Click here to see the best practices for image file naming and sequencing. Note: Click here to see image uploading in action. Pixpa allows you to add YouTube and Vimeo video in website gallery. Click on the particular gallery in the website section where you want to add videos. Click on Videos in the Add Media dropdown on the top right of the page. We support only YouTube & Vimeo at the moment. You need to upload your videos to YouTube & Vimeo first. In the next step, you would see a popup window where you need to paste the YouTube / Vimeo link in the URL text box. System will automatically pull the high-res screenshot of your video from Youtube / Vimeo if available. 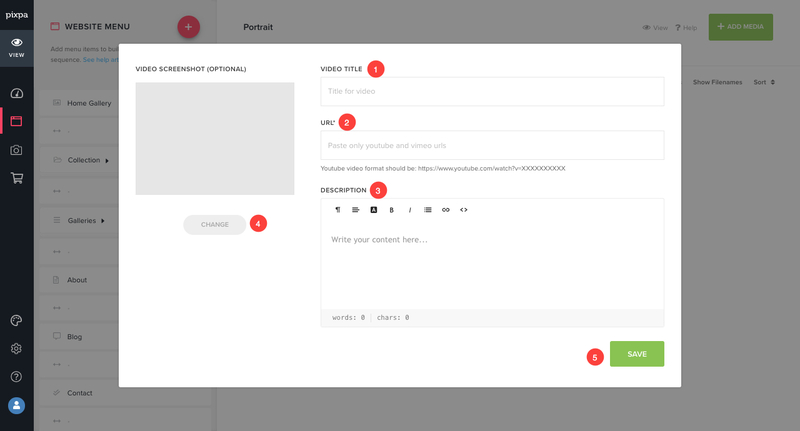 URL – Paste your Youtube/Vimeo URL here. As paste the URL, you would see the screen shot of your video on the left hand side. Description – Add your video description here, if any. Video Screenshot – Pixpa system will automatically pull the high-res screenshot of your video from Youtube / Vimeo. In case, if the high-res screenshot is not available or if you want to add any custom screenshot with your video then Pixpa allow you to upload a custom screenshot from here. Save – Click on Save when you are done. You would see the success message as your video is added. Note: Click here to see video addition in action. Pixpa allows you to add text / HTML slide in website gallery. Click on the particular gallery in the website section where you want to add Text/HTML slide. Click on HTML Slide in the Add Media dropdown on the top right of the page. In the next step, you would see a popup window where you can add any Text or HTML with their featured image. 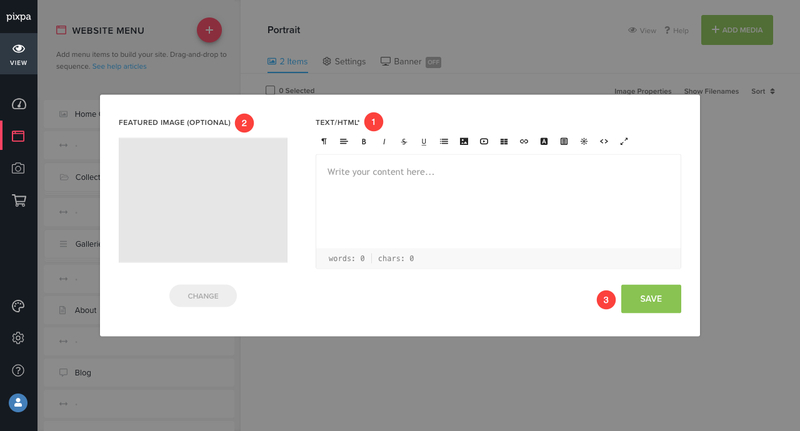 Text / HTML – Add your text and HTML here. Click here to know more about Pixpa text editor. Featured Image – You can add any custom image with your HTML slide which will be used in grid gallery layouts. Save – Click here to save this HTML slide. Note: Click here to see HTML slide addition in action. Click here to see how to add Image / Text / Video in a blogpost. Click here to see how to sequence items in a gallery. 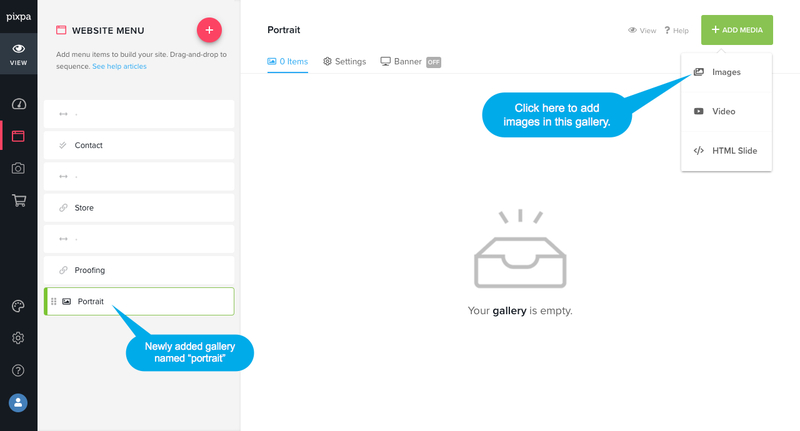 Click here to manage Gallery settings.